Are you getting excited about the holidays? I know I am. I’m about to switch to cookie baking mode! Boy, oh, boy am I excited to share this post with you today! 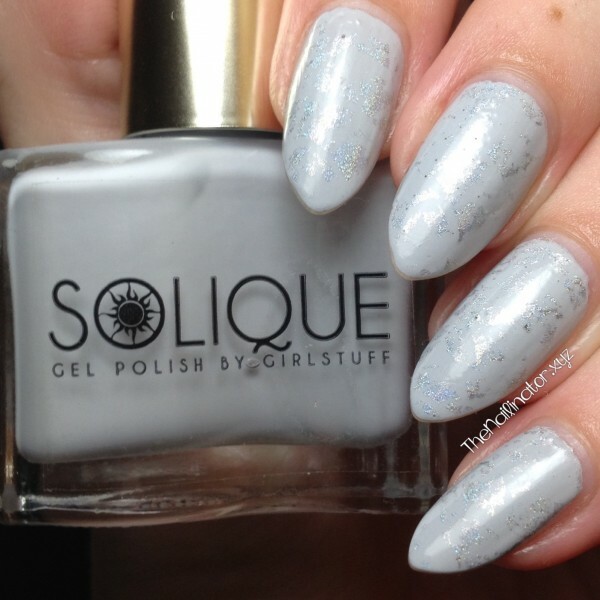 A couple months ago, Girlstuff released their new Solique line of Gel polishes. These “gel” polishes are meant to be used as a system with the nail color and top coat and they promise the durability and shine of gel polishes without the need of a UV lamp to dry them or special remover or soaking to take it off. They are supposed to dry within minutes and give you high shine with extended wear. It all sounds too good to be true! I don’t normally wear polishes for a whole week, but the timing of me receiving these pretties and testing them out was just right as we were neck deep in a MAJOR renovation of our office building. Since October, I have either been helping the hubs with the renovation or working extra hard at keeping things going smoothly at home so that he could focus on the renovation. I put these polishes through some serious testing! Let’s check out the color options before I get into the wordy bit. Manila Girl – is a fabulous red with a fabulous name (For those of you outside the Philippines, Manila is the country’s capital city.). This crelly is a two-coater and very squishy looking. I love a good red, and this did not disappoint! Easy cleanup and no staining! Yay! Such A Fantasy – is a girly, pink cream that needs two coats. I guess it is the crowd-pleaser of the lot because I got heaps of compliments while wearing this. Love Me Like You Do – is very chic, light-gray creme that I think is a timeless, classy shade. With a little care this is a two-coater. I say that because I was watching a movie while applying this one, and I messed up a couple of nails and had to put a third coat on. It still dried super fast! Hush – is a lovely, almost white creme that has just a whisper of pink to it. It’s perfect for people like me who like the crispness of white nails but don’t like it to look like I used correction fluid on my nail. 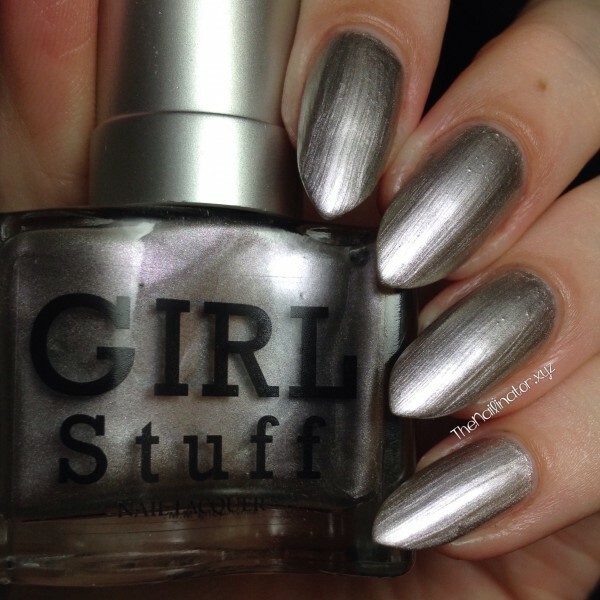 Hush is a two-coater, which is hard to find with a polish of a delicate tint like this. 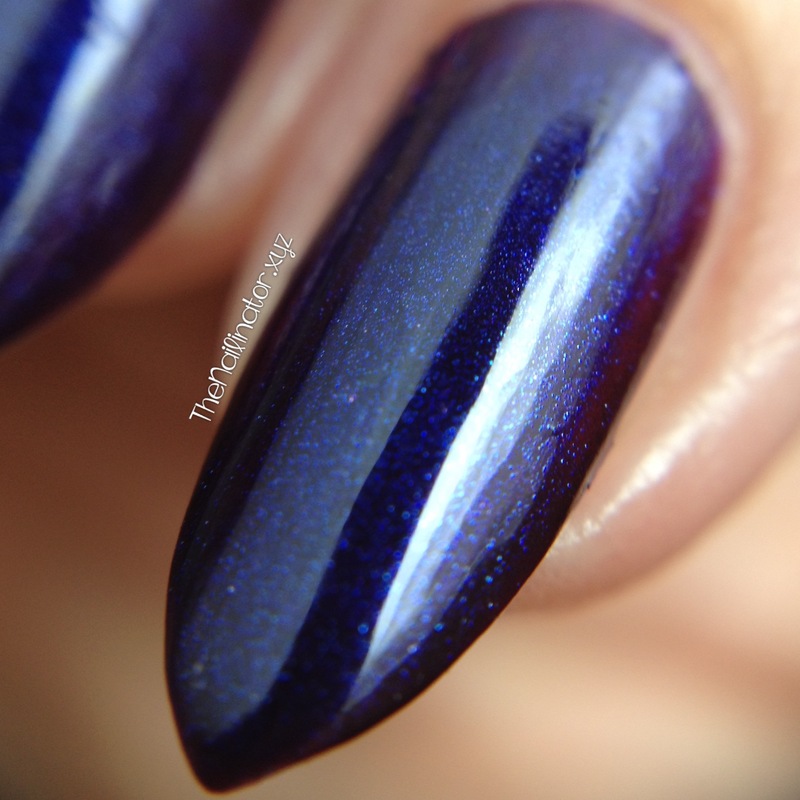 Midnight Dreams– is a dark blue crelly loaded with tiny, shimmery flecks. It has a purple luster that can be seen in certain lighting, but I wasn’t able to capture that, as you can see. It is a two-coater and the only dark shade of the collection. 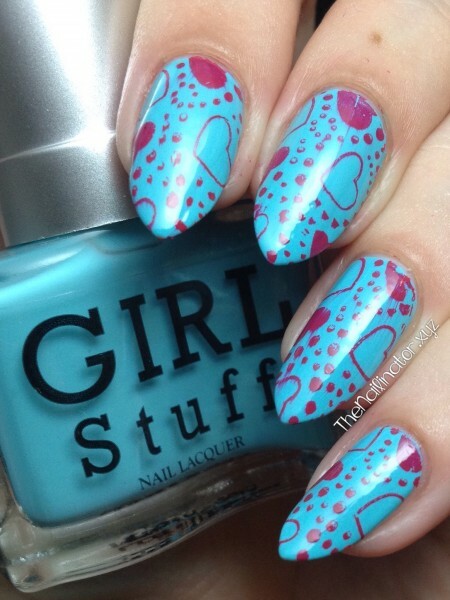 Baby Blues – is a pastel blue creme that stands out without being too in-your-face. With care, you can get away with two coats of this baby. Wow! Wow! Wow! You guys, this system is AMAZING! 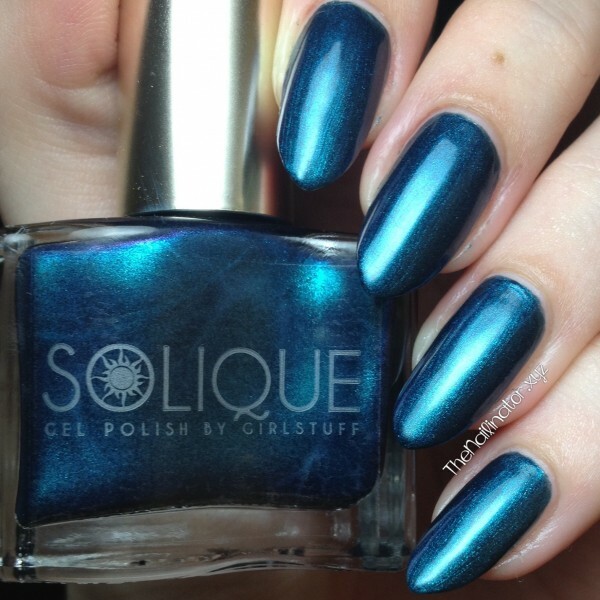 First, let me remind you that these polishes are meant to be worn with the special Solique topcoat. Also, I have never used or worn regular gel polish myself, but I have heard the pros and cons of them. I have also removed gel polish for a friend and know the difficulties of gel removal. Application – The formula on these is a bit thicker than most regular polishes so you may need to take more time and care when applying. I found that using more product on the brush helps as well. Cleanup around the cuticles was no problem. Drying time – This is a quick drying system, and including the three coats on a couple of nails that I messed up a bit, my nails were dry in a flash. No need for a UV lamp like regular gel polishes. Removal – When I removed my friend’s gel manicure, it took ages. Lots of soaking (with pure acetone…boo! ), waiting, and rubbing on the nail to get it all off. 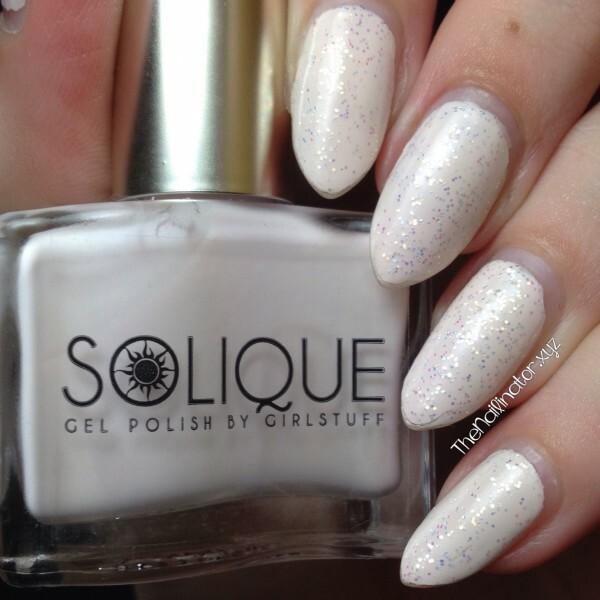 With Solique Gel, I used my favorite non-acetone polish remover on a cotton ball and it came right off. Wear time – Now to the part that I’m sure you are really curious about. 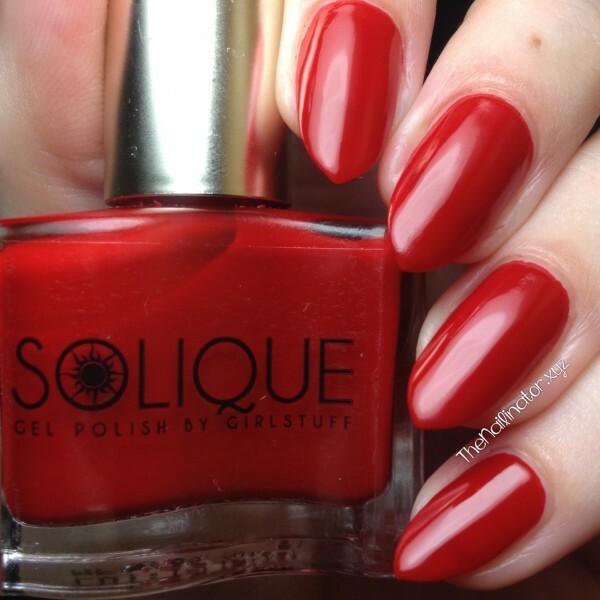 How did Solique Gel Polish hold up over the test of time? Did I get the extended wear promised? Let me answer that by showing you a picture of my extended wear test results of Hush (with a bit of glitter). Keep in mind that this manicure endured a certain number of days of taping, floating, and sanding drywall, and sanding and staining wood panels – in addition to all my regular chores and work at home. How many days old would you guess this manicure is? Seven days old? Not even close! This is actually FOURTEEN DAYS of wear and tear! 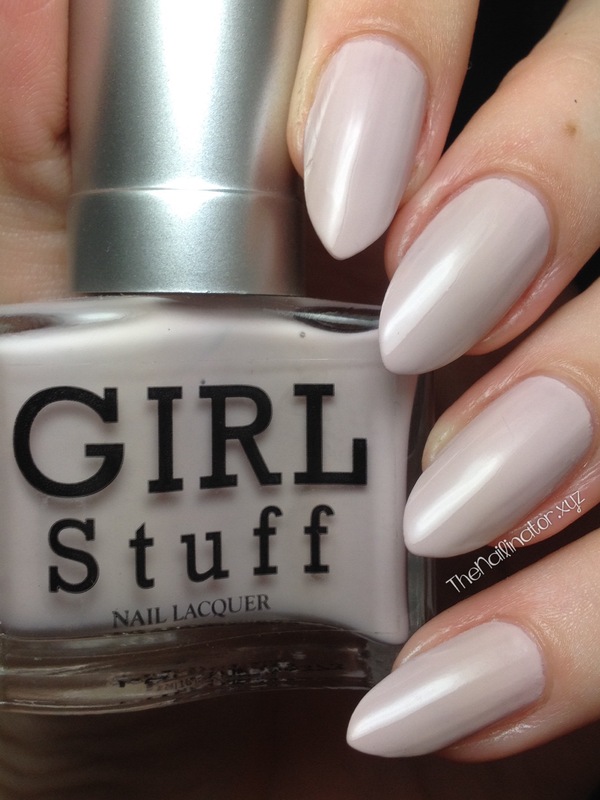 Have your nails ever looked like this after wearing the same polish for 14 days? I know mine haven’t! Still not convinced? How about this 10-day wear shot of Love Me Like You Do (with some subtle holo stamping). Oh yeah! If you want to cut down on your salon visits or how often you do your nails at home, then you will love this new product. The downside – Really, the only downside to this system is that the color selection is limited. But they just released a new shade so they are already adding to the line. Yay! These would make a great gift for yourself or for a special someone in your life. Keep in mind that the Solique line is meant to be used as a two-part system. 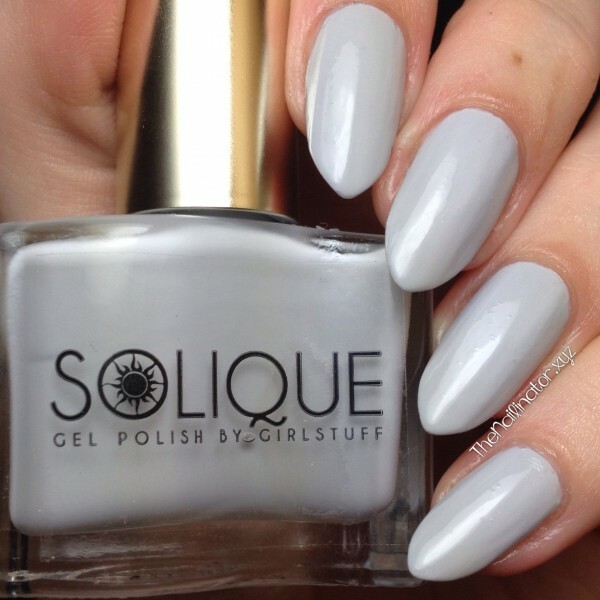 These amazing results cannot be guaranteed if you do not use the Solique topcoat. Solique polishes cost 180Php per bottle and the Solique topcoat is 200Php per bottle. 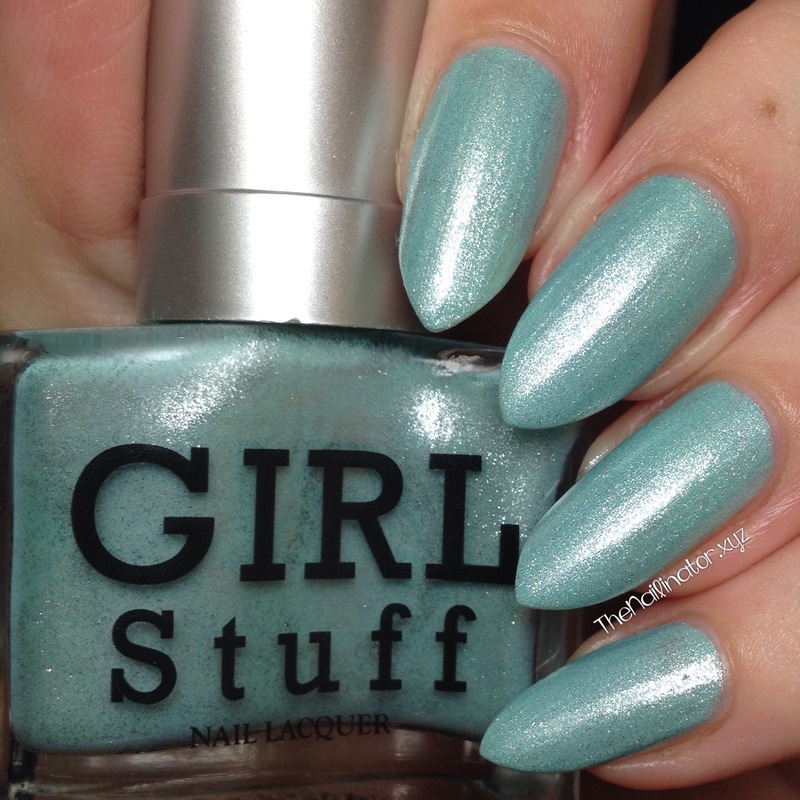 They can be purchased at any Girlstuff kiosk or directly from Girlstuff online. Their customer service is fantastic, so do not hesitate to contact them for any inquiries or shipping. 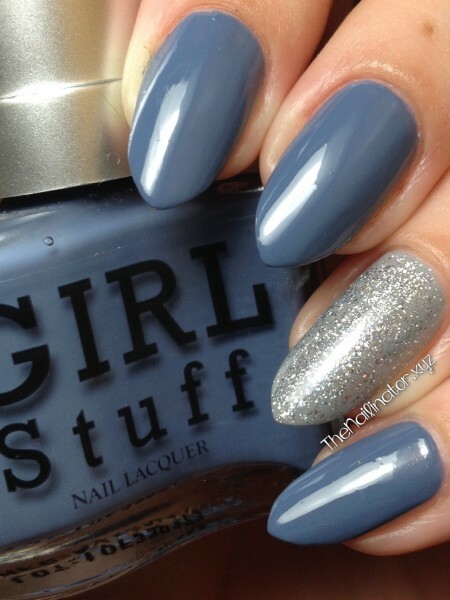 You can also check out their website and contact them about having polishes shipped to you. 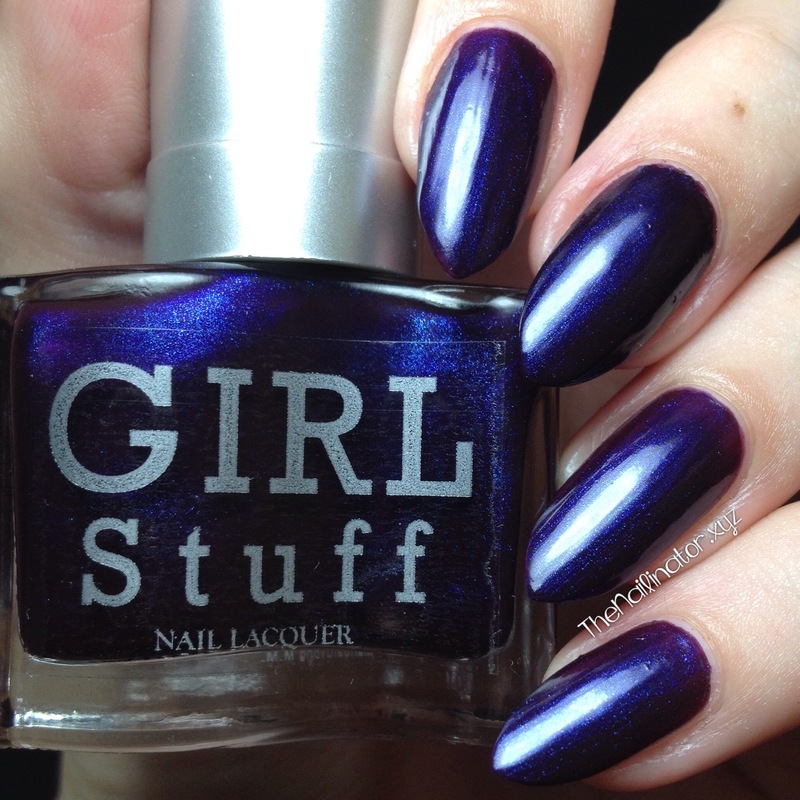 Check them out on Facebook and follow them on Instagram @girlstufforever to keep up with their news and promotions. I hope you found this review helpful. I love sharing great products with you and I try my best to be thorough and to include information that I personally find helpful when choosing products. Do let me know in the comments if you have any questions. Enjoy the holiday rush but don’t forget to stop and smell the roses (or in my case stop and hug the kiddos). Have a lovely day and keep smiling! Yes, it is Monday! But my Monday is almost over, and it honestly hasn’t been too bad. I decided to turn the air conditioner on today and enjoyed a blissfully cool day at home with the kids making up goofy stories, working on cleaning their room, and doing school. We also enjoyed learning about iguanas and sea turtles! Today I’m sharing a quick and easy nail art look that can take an already fine-looking manicure to the next level. If you follow me on Instagram, you have probably already seen the first picture below. (Keep scrolling for something new though!) 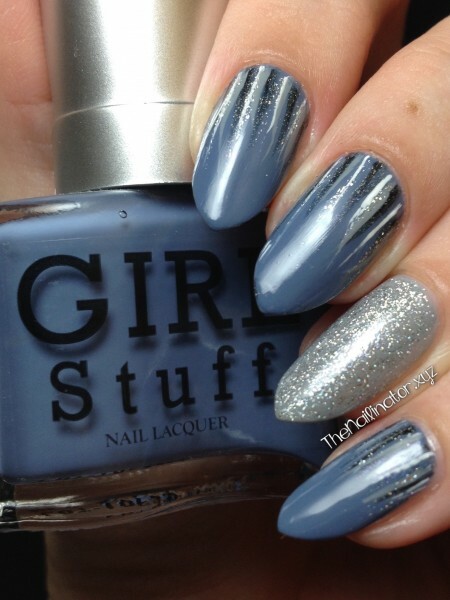 I started with Girlstuff Diana which is a lovely dusty blue creme with a hint of purple to it. (Blurple! Yay!) For my accent nail, I chose L.A. Girl 3D Silver for some sparkle. To add more pizzazz, I used a thin striper brush and added some stripes at the base of my nails tapering off toward the tips. As you can see, I used gray, white, black, and silver polish for the stripes. Easy peasy! They call this “Waterfall” nail art. I always love trying new, super-quick nail art looks. Don’t you? 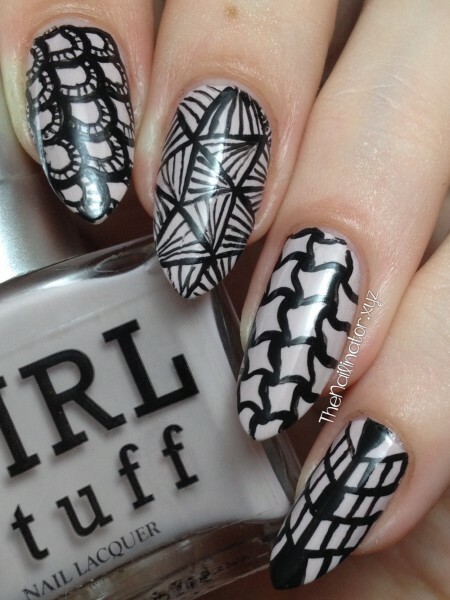 Please comment and share your favorite go-to nail art look for when you need something quick and easy. I hope you are having a great day. Keep smiling! How was your weekend? Mine was quite busy and stressful, but it was a good one overall! I was looking for the song “Swinging on a star” by Bing Crosby and scored an album on iTunes for $3.99 for 100 Bing Crosby songs! I’m listening to it as I type this. I LOVE oldies! Especially Doris Day, Elvis Presley, Dean Martin, and the like. Anyhooo… y’all came here for the nails! I won’t disappoint! 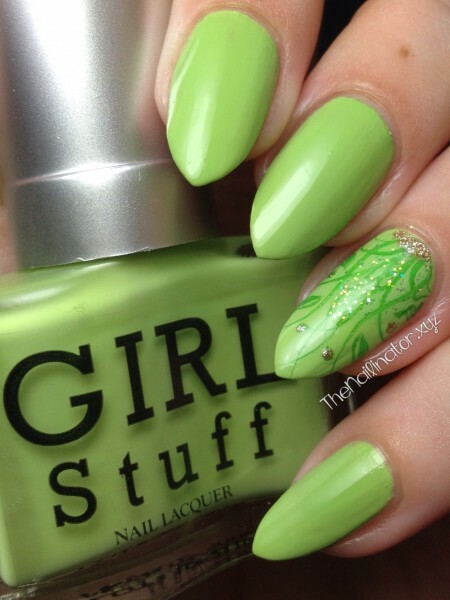 I just published my review and swatches of the new Bloggers’ Elite Summer Collection from Girlstuff this past weekend. Please do check out the post if you haven’t already. 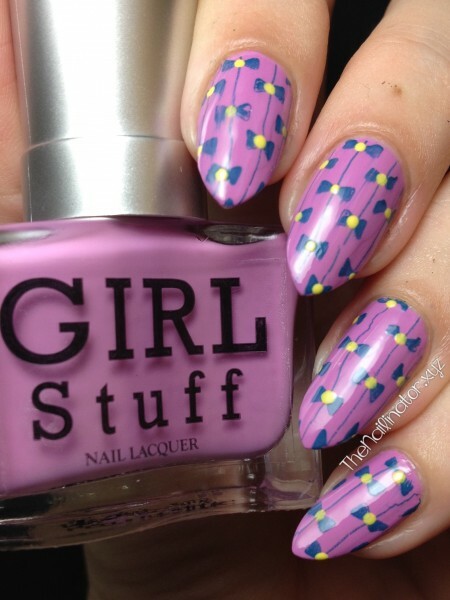 I thought I would share the easy stamped nail art I wore with each one. I used my Pueen stamping plates from their Love Elements Collection which I bought a couple of years ago. With Topaz Horizon, I decided to use plate 38 from the Love Elements collection and a dark purple polish which worked very well. I love the finished look! I picked a dark pink polish to stamp an image from plate 43 onto Struttingonsunshine. The image stamped well, but I had issues with the polish streaking when I went to add topcoat. 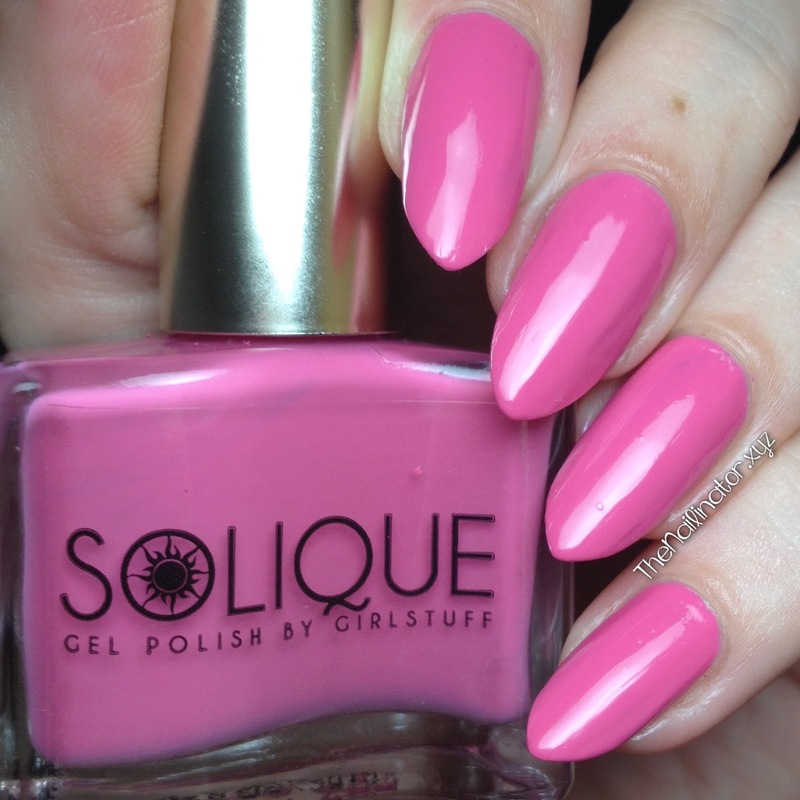 I even floated the brush across the design, so I guess the pink polish just didn’t want to stick to SOS. Still pretty and eye catching! With AskMeWhats, I stamped this cute bow design using Pueen 29 and a dark blue polish of mine. 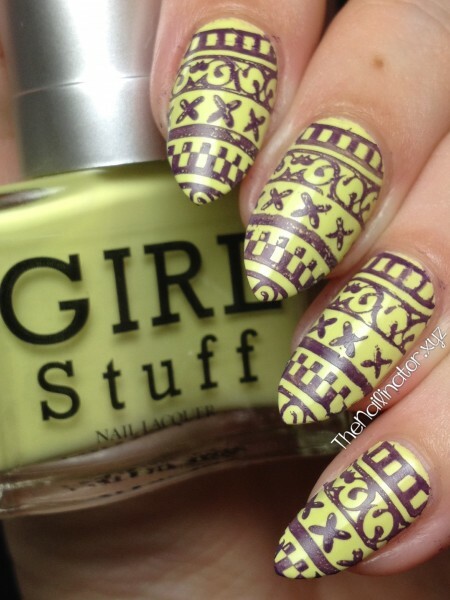 Then I added some yellow dots to make the design pop! I like how it turned out. I wanted something whimsical for an accent nail with Go Jackie Go. This is what I came up with using Pueen 46. I dabbed a bit of iridescent glitter at the base of my nail. Then I stamped this image over it. Then with a dotting tool, I added some gold dots for a final touch. It turned out so pretty! I had fun coming up with a complimentary stamped look for each of these colors. I haven’t had as much time for hand painted designs lately, but one can still be creative with stamping, and though simple, it definitely takes your nail polish to another level. Mr. Nailinator has been bugging me to try my hand at another insanely time-consuming design, and I’ve been toying with the idea. Maybe next week after the kids and I close out the school year. Here is hoping the Monday blues don’t get you down. Always remember that coffee is your friend! Have a good one!